Home of The Incredible Sestina Anthology. 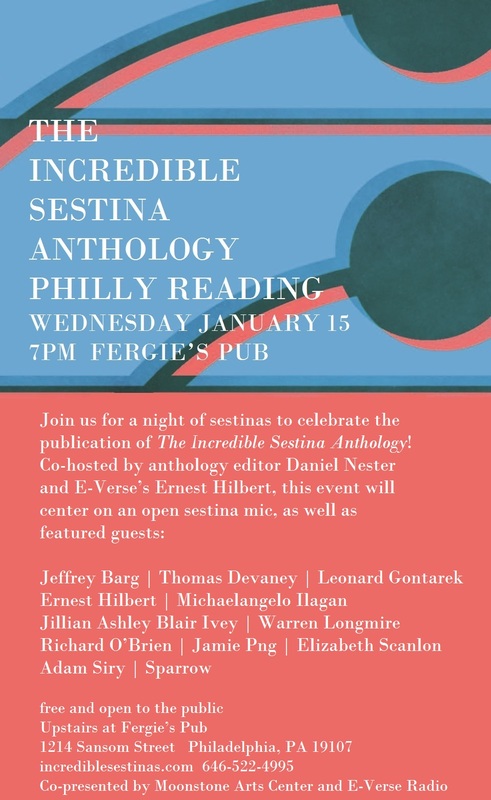 Coming January 15: Incredible Sestina Anthology Reading in Philadelphia! A week from tomorrow, party people! The Incredible Sestina Anthology comes to Philadelphia! It’s all going down at Fergie’s Pub. Come down and hear an all-sestina reading, bring a sestina of your own, or write one at the bar and read it at the open mic. Jeffrey Barg is a writer, actor, musician and urban planner from Philadelphia. He composed the music and lyrics for Wars & Whores: The Henry IV Musical (now known as The Ballad of King Henry), a Shakespearean folk musical, in the 2011 Philly Fringe. He can be seen this spring in Private Lives at the Spotlight Theatre in Swarthmore. Thomas Devaney is poet, teacher, and critic. He is the author of two poetry collections,A Series of Small Boxes (Fish Drum, 2007) and The American Pragmatist Fell in Love(Banshee Press, 1999), and a nonfiction book, Letters to Ernesto Neto (Germ Folios, 2005). His book The Picture That Remains with photographer Will Brown is forthcoming from The Print Center of Philadelphia. Devaney’s poems have been published in The American Poetry Review, The Brooklyn Rail, FENCE, jubliat, The AWL, and at PennSound. Anthologies include Emergency INDEX (Ugly Duckling Presse, 2011), A Best of FENCE: The First Nine Years (FENCE Books, 2009), POEM: Poets On (an) Exchange Mission (Fish Drum/Double Change, 2009 bilingual French-English edition), WALT WHITMAN, Hom(m)age, 2005/1855 (Turtle Point Press and Editions Joca Seria, 2005) and American Poetry: The Next Generation (Carnegie Mellon, 2000). Devaney is currently a Visiting Assistant Professor at Haverford College. Leonard Gontarek is the author of five books of poems: St. Genevieve Watching Over Paris, Van Morrison Can’t Find His Feet, Zen For Beginners, Déjà Vu Diner, and He Looked Beyond My Faults and Saw My Needs (Hanging Loose Press, 2013). His poems have appeared in American Poetry Review, Field, Poet Lore, Verse, Exquisite Corpse, Poetry Northwest, and in the anthologies, The Best American Poetry, The Working Poet, and Joyful Noise: American Spiritual Poetry. He has received two Pennsylvania Arts Council Poetry Fellowships and was the 2011 Philadelphia Literary Death Match Champion. He conducts poetry workshops at Musehouse and in the Philadelphia Arts in Education Partnership.He hosts the Green Line Café Reading and Interview Series. Check him out online at http://www.leafscape.org/LeonardGontarek and http://www.decompmagazine.com/dark.htm. Ernest Hilbert is the author of two collections of poetry, Sixty Sonnets and All of You on the Good Earth, as well as a spoken word album recorded with rock band and orchestra, Elegies & Laments, available from Pub Can Records. 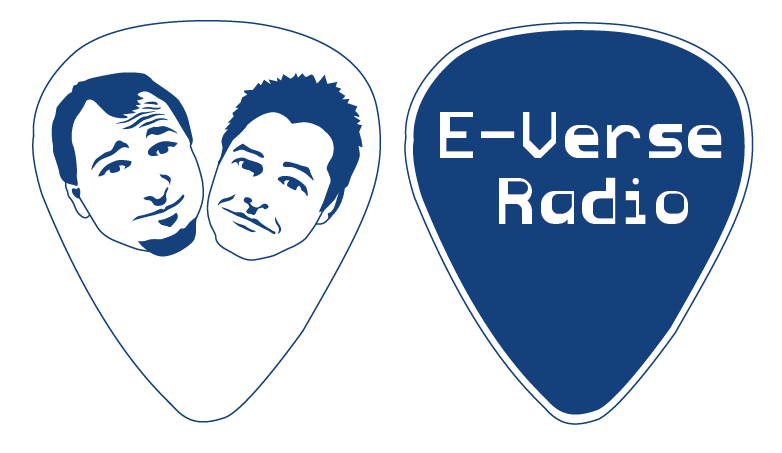 He hosts the popular blog E-Verse (www.everseradio.com) and the E-Verse Equinox Reading Series at Fergie’s Pub. His poems have appeared in The New Republic, Yale Review, American Poetry Review, Harvard Review, Parnassus, Boston Review, Verse, New Criterion, American Scholar, and London Review, as well as in anthologies, including the Swallow Anthology of New American Poets and two Penguin anthologies, Poetry: A Pocket Anthology and Literature: A Pocket Anthology (2011). He works at Bauman Rare Books in Philadelphia, where he lives with his wife Lynn Makowsky, the Keeper of the Mediterranean Section at the University of Pennsylvania Museum of Archaeology and Anthropology. Michaelangelo Ilagan is an interactive designer, freelancer writer and photographer who has done graphic/UI design and front-end development for marketing firms, advertising agencies and e-learning corporations. He is the editor-in-chief of Geekadelphia.com, which covers all that is geek in the City of Brotherly Love. Jillian Ashley Blair Ivey is a foodie, a compulsive animal rescuer, a proud native Texan, a huge Phillies fan, and a lover of the written word. Jill is the former editor of Phillyist and a founding editor at KeyPulp (currently on hiatus), and spent her undergrad years working on Penn’s campus at the Kelly Writers House. A member of the first matriculating class (but not first graduating class) of the Rutgers-Camden MFA program, Jill has published in Quake (now defunct), Origivation Magazine, Slush, and in the Institute of Contemporary Art-published publication Rodney Graham .She Stood UpFor Herself [sic]. Her piece “Yankee Land,” an essay about coming to terms with being becoming a Philadelphian, which was originally written for a Rutgers MFA class, appeared in the book Philadelphia Reflections: Stories from the Delaware to the Schuylkill (The History Press 2011), and last summer, she published an essay about her Pennsport home in the popular Philly Love Notes blog. Of course, some of Jill’s most prolific writing has not appeared under her byline; she has ghost-written dozens of articles for her clients working as a strategic communications consultant at various agencies, and as a freelancer. Warren Longmire’s work has appeared in Pax Americana, Certain Circuits, The New Purlieu Review and two chapbooks: Ripped Winters and Do.Until.True. He is a poetry editor for Apiary Magazine, a founding member of the UPenn Excelano Spoken Word Collective, and a frequent Philly rep in national slam competitions. When pried from his day job behind the dull glow of laptop screen black with programming language, he can be found making abrupt pauses and wild hand gestures in poetry venues throughout the tri-­state area. Richard O’Brien completed his MFA in Creative Writing at Fairleigh Dickinson University in 2012. His poems have appeared in Falling Star Magazine, Stoneboat, and O-Dark-Thirty, where his poem, “The Ballad of the Ur-Wasp,” was recently nominated for a Pushcart Prize. His first book of poems, Tripping in the Dark, will be published by Unsolicited Press in May 2014. Jamie Png is a Singaporean-Australian cheesemaker who lives in Philly and works on a dairy farm in New Jersey. She studied creative writing and photography at the University of Melbourne, and experimental poetry with Charles Bernstein at the University of Pennsylvania. At Penn, she volunteered at the Kelly Writers House and worked as an assistant editor on the PennSound Digital Poetry Archive. Past lives include managing an art gallery, interning at WXPN and WW Norton, and reading manuscripts for an Italian publishing house. A foray into food writing turned into a Master’s degree in Food Studies and Culture from NYU, after which she further confounded her parents by pursuing a life of manual labour in bakeries, cheese shops, and farms. One day she hopes to open her own urban cheesemaking facility. Elizabeth Scanlon is co-editor of The American Poetry Review. Her poems have appeared Gulf Coast, Lit, Ploughshares, Swink, Smartish Pace, and The Colorado Review. Adam Siry is a member of Philly Improv Theater, where he a member of the sketch teams The Flat Earth, The Bat, and Kid Twist. Sparrow lives in a doublewide trailer in the slumbering hamlet of Phoenicia, New York with his wife, detective novelist Violet Snow. Sparrow has recently been translating Aimé Césaire, with existential haste.